Step 1. Wrap the florist block with the wrapping paper. Step 2. Place a marshmallow on a cutting board and put a mini patty pan on top (right side up). Then, using the skewer in a quick downward motion, stab them together. Step 3.Pull the patty pan down the skewer and coat the marshmallow in icing. Step 4. 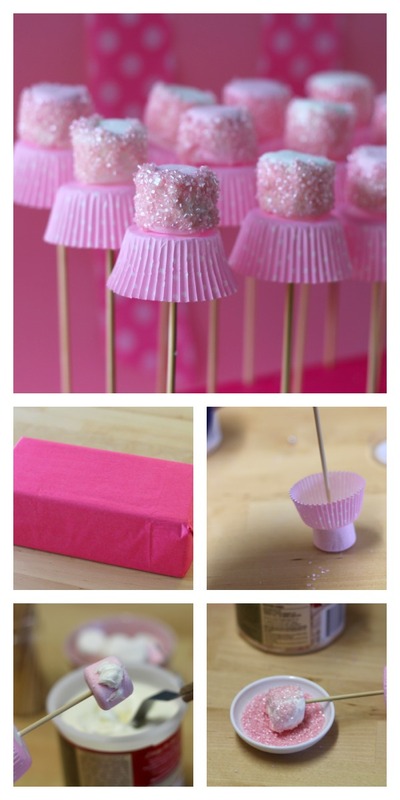 Roll the marshmallow in sugar crystals and then push the patty pan back up the skewer to meet the marshmallow. I used some ready-made icing I had left in the fridge for this project but you could also use sugar syrup or make your own icing. The pink sugar crystals were in a container of multiple sprinkles. You could also use jelly crystals if you can’t find these.